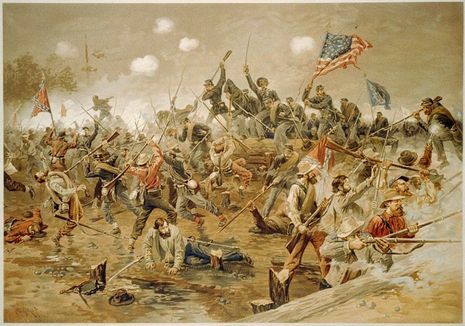 The Battle of Spotsylvania Court House, sometimes simply referred to as the Battle of Spotsylvania, was the second major battle in Lt. Gen. Ulysses S. Grant's 1864 Overland Campaign of the American Civil War. 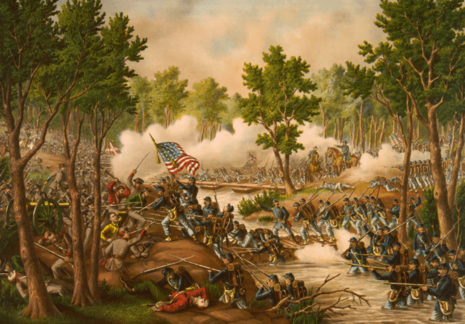 It was fought in the Rapidan-Rappahannock river area of central Virginia, a region where more than 100,000 men on both sides fell between 1862 and 1864. The battle was fought May 8–21, 1864, along a trench line some four miles (6.5 km) long, with the Army of Northern Virginia under Gen. Robert E. Lee making its second attempt to halt the spring offensive of the Union Army of the Potomac under the command of Lt. Gen. Grant and Maj. Gen. George G. Meade. Taking place less than a week after the bloody, inconclusive Battle of the Wilderness, it pitted 52,000 Confederate soldiers against a Union army numbering 100,000. 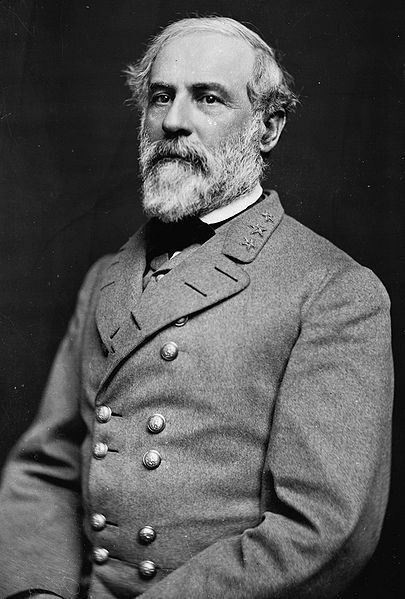 After the Battle of the Wilderness, in which Lee delayed the Union advance, Grant decided to take advantage of the position he held, which allowed him to slip his army around Lee's right flank and continue to move south toward the Confederate capital of Richmond, Virginia. He already had troops on the move by the night of May 7, just one day after the Wilderness fighting ended, and on May 8, he sent Maj. Gen. Gouverneur K. Warren and his V Corps to take Spotsylvania, 10 miles (16 km) to the southeast. Lee anticipated Grant's move and sent forces to intercept him: cavalry under Maj. Gen. J.E.B. Stuart and the First Corps, commanded by Maj. Gen. Richard H. Anderson (its usual leader, Lt. Gen. James Longstreet, had been wounded in the Wilderness). 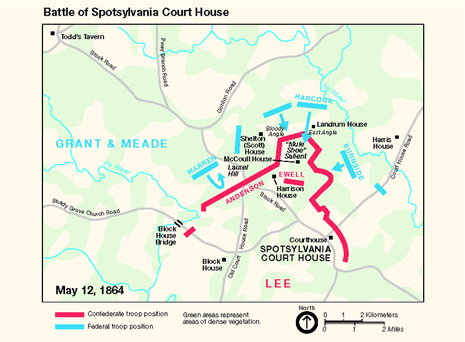 The Confederates won the race to Spotsylvania, and on May 9, each army began to take up new positions north of the small town. As Union forces probed Confederate skirmish lines on May 9 to determine the placement of defending forces, Union VI Corps commander Maj. Gen. John Sedgwick was killed by a sharpshooter; he was succeeded by Maj. Gen. Horatio G. Wright. Lee deployed his men in a trench line stretching more than four miles (6.5 km), with artillery placed that would allow enfilade fire on any attacking force. There was only one major weakness in Lee's line—an exposed salient known as the "Mule Shoe" extending more than a mile (1.6 km) in front of the main trench line. Lee recognized this weakness during the fighting of May 10, when twelve Union regiments under the command of Col. Emory Upton followed up a concentrated, intense artillery attack by slamming into the toe of the Mule Shoe along a narrow front. They actually broke the Confederate line, and the Second Corps had a hard time driving them out. Upton's attack won him a promotion on the spot to brigadier general, and it became a staple of military textbooks on how to break an enemy trench line. Similar tactics were used by Germany in Operation Michael, its successful March 1918 offensive during World War I. Other Federal assaults on May 10 were less successful, and the day was generally characterized by uncoordinated frontal assaults that Grant ordered impulsively. Repeated attacks were particularly futile along the Confederate left, where Union General Warren failed many times to storm a position called Laurel Hill. 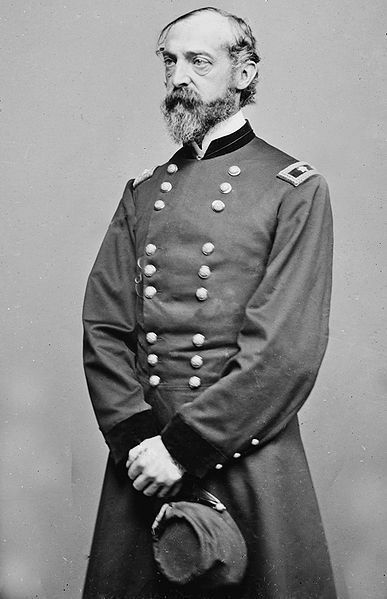 On May 11, Grant began the planning for a new major assault aimed at the Mule Shoe salient, with the intent of employing Upton's tactics on the level of an entire corps. Lee took Grant's inactivity as a sign that the Federal Army was getting ready to pull back, either for a retreat, or for another sidle to the East, and as a result, he weakened the critical sector of the Mule Shoe by withdrawing its artillery support. Grant's pre-dawn assault on the Mule Shoe on May 12 was initially a complete success. The well-fought II Corps of 20,000 men, commanded by Maj. Gen. Winfield S. Hancock, led the attack against the Mule Shoe in the same manner that Upton had attacked on May 10. 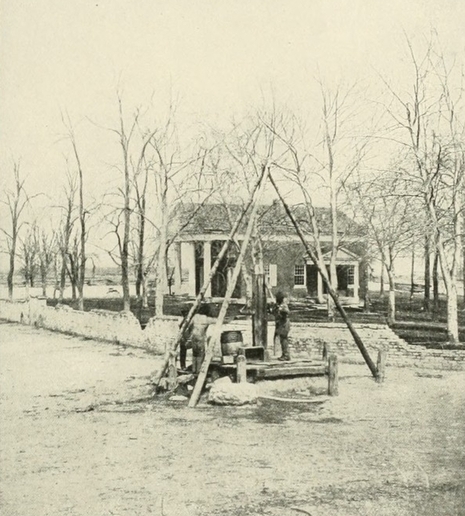 This time, the breach in the Confederate line was complete, thanks in part to the absence of Confederate artillery support, but also because many of the Confederates suffered from wet powder in their rifled muskets due to rainfall the night before, and thus found that their guns would not fire. Hancock's II Corps took close to 4,000 prisoners, destroying Edward "Allegheny" Johnson's division of the Confederate Second Corps. Both the divisional commander and one of his brigadier generals, George H. Steuart, were captured. Then the fighting bogged down, in part because Grant had not properly prepared a second wave to take advantage of the success. Anxious to sustain momentum, Grant ordered supporting attacks from Wright's VI Corps, and from the IX Corps of (Maj. Gen. Ambrose E. Burnside), but the attacks were not well coordinated, and failed to recapture the momentum of the attack. Lee was also able to shift thousands of his men to seal the breach, most notably launching a counterattack with Brig. Gen. John Brown Gordon's division, and also securing much help from the able leadership of Brig. Gen. Stephen D. Ramseur. Because of the severity of the crisis, Lee felt compelled to personally lead soldiers in the counterattack. His men realized the danger this would pose to him, however, and refused to advance until Lee removed himself to a safer position in the rear. The several "Lee to the rear" episodes later became famous, and were an intense example of the personal bond that Lee's soldiers felt for him. The battle in the Mule Shoe lasted for an entire day and night, as the Confederates slowly won back most of the ground they had lost, inflicting heavy losses on the II Corps and on the reinforcing VI Corps in the process. The fighting was characterized by an intensity of firepower never previously seen in Civil War battles, as the entire landscape was flattened, all the foliage destroyed. Both sides, fighting from back and forth over the same corpse-strewn trenches, engaged in hand-to-hand fighting somewhat reminiscent of battles fought during ancient times, and there were many descriptions of the field as a morass of corpses, piled so high that wounded men buried underneath them were pressed down into the mud, where they drowned. 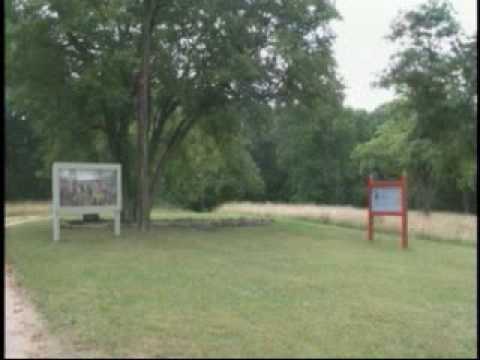 The angle between the Union II and VI Corps became known as the "Bloody Angle of Spotsylvania", where perhaps some of the most savage fighting of the whole Civil War took place. Grant, checked by Lee for a second time, responded as he had two weeks earlier. He shifted the weight of his army to his left flank and again moved to the southeast along roads Lee was unable to block. By May 20–21, the two armies were on their way to take positions along the North Anna River, another dozen miles closer to Richmond. 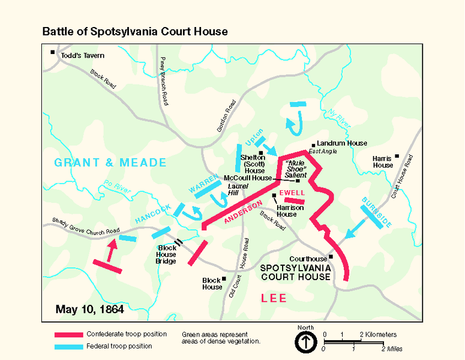 The pattern for the Overland Campaign was set by its first two weeks, and the battles of the Wilderness, Todd's Tavern and Spotsylvania Courthouse. This was a slow but steady series of arcing shifts to the left by Grant, progressing to the southeast and ever closer to Richmond, with the mortal bleeding of the Army of Northern Virginia in the process. While Grant could not move decisively upon Richmond due to Lee's possession of the advantage of interior lines, it was the irrecoverable losses suffered by the Confederate forces that would prove decisive. Once again, Lee's tactics had inflicted severe casualties on Grant's army. This time, the toll was over 18,000 men, of which close to 3,000 were killed. 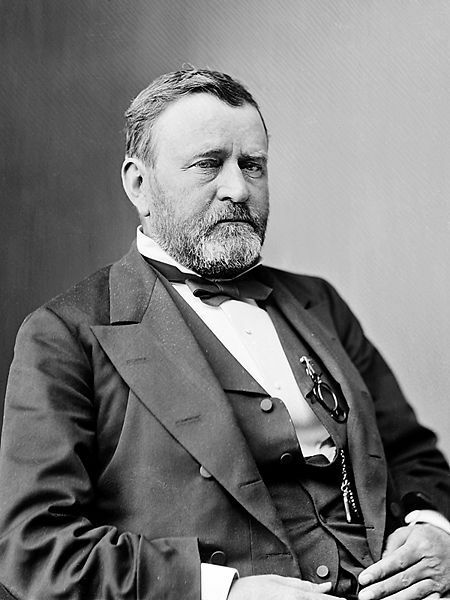 In two weeks of fighting, Grant had lost 35,000 men, and another 20,000 went home when their enlistments ended. In fact, Grant at one point on the North Anna had fewer than 65,000 effectives. But Lee did not come out of these battles unscathed, either. 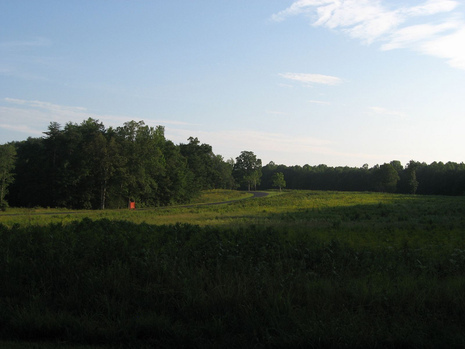 At Spotsylvania, he lost another 10–13,000 men, and the Confederates had to pull men away from other fronts to reinforce him. Making matters worse, the army was taking heavy losses among its veteran units and its best officers. This may have saved Grant from a disaster on the North Anna, when his decimated army was positioned badly and was ripe to be attacked. Lee never did, because the Army of Northern Virginia was unable to do so. In fact, Lee's army would never regain the initiative it lost in those two weeks of May 1864.